← TTIP: What’s the Deal? As anti-government sentiment brewed in Mexico last month, the IMF published an “economic health check” report forecasting that the Mexican economy would grow a modest 3.5 percent in 2015. The report mentioned that the predicted growth could be attributed to liberal structural reform in key sectors, namely the oil sector. Since then, however, the Mexican economy has shown signs of weakness, with the peso depreciating in November and December. Several negative externalities have played a role in the peso’s slide, such as the decreasing price of oil, a stronger dollar, and the possibility of higher interest rates in the United States. It should also be noted that the peso’s depreciation has paralleled the social instability that has engulfed Mexico since the 43 normalista students disappeared. This month, the Mexican regulatory authorities ratified the rules for foreign companies to bid on shallow water oil fields. However, it is doubtful whether these liberal measures will have an economic effect in 2015—bidding on the oil fields will not take place until July 2015, and foreign companies might not commence upstream operations until 2016. Even if the state-owned oil company and its international partners were extracting at full capacity by January 2015, the depressed international price of oil has severely strained profit margins. Although at the moment Mexico has resisted the fall in prices more resiliently than other Latin American oil exporters, hydrocarbon revenues account for one third of the country’s budget. At some point in the near future the adverse effects of cheaper oil will start showing on the Mexican economy. Cheaper oil has played a part in the recent corrosion of the Mexican peso. In the past two weeks, the peso has lost 4 percent of its value. The peso’s slide, however, is not caused directly by the fall in oil prices. In the past month, there has been widespread public dissent from various interests against the state for the central government’s reaction to the disappearances of 43 students. Though the incident occurred in the peripheral Guerrero state, protests have escalated across the country and the capital has been held at a standstill for the month of December. These protests have destabilized the economy, and there is a clear correlation between the peso’s slide and the strength of protests in Mexico’s capital. If the protests were contained at the local level, macroeconomic and financial repercussions could have been avoided. The central government’s relaxed and conservative response to the crisis of the 43 missing students, however, only deepened anti-establishment sentiment at the national level. Once this happened, the international media picked up the story and soon all major media outlets—particularly the BBC—were covering dissent movements. The international media’s coverage of Mexico’s social crisis appears to have affected the confidence of foreign investors. The broadcasted national crisis, coupled with a resurging and strengthened dollar, has made the Mexican economy less competitive. As a result, overall business confidence has waned in the past two months. There is more—lower oil prices, destabilizing protests, and lower business confidence are not the only reasons why the peso has depreciated and why investors should be skeptical of the 3.5 percent growth forecast posted by the IMF. 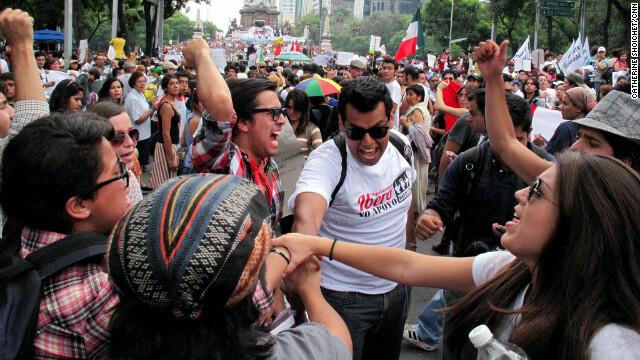 In the long run, protests could bring about much needed reform in Mexico. In the near term, they are not helping the economy. The July 2015 midterm elections will only politicize the social movement currently taking place and will create further divergence between parties. The first half of 2015 is expected to be full of personal attacks between party leaders from both sides of the ideological spectrum. The left of center party, the PRD, has been fractured and almost destroyed after the normalista disappearances. The mayor of Iguala—the city where the clash between security forces and students occurred—was a PRD party leader. As the governing party, the PRI has not escaped the crisis. As was mentioned, the PRD local government mistake gravitated to the national stage, which in turn has tarnished the reputation of Mexican President Enrique Peña Nieto, and, in turn, the PRI party that he represents. Some say the PAN, the right of center party, might fare better than the PRI or PRD in the midterm elections, although this is improbable. The PAN is still reeling from its inability to provide security during the Calderon presidency (2006-2012). With no alternative party gaining mass support, it seems that the Mexicans will vote in another divided congress with no clear majority—again, not a good sign for the economy. This time, President Peña Nieto will not have the popular backing and optimistic impulse that he enjoyed during his first two years in office. Such polarizing discourse and lack of legislative cohesion will most likely push business confidence even lower because the economic direction of Mexico will be increasingly difficult to predict. Even though President Peña Nieto’s liberal intentions are clear, the legislature is and most probably will remain divided regarding the economic direction of the country after the midterm elections. These political conditions could push capital towards more stable markets elsewhere. We can already see the adverse effects of a highly divided society on the reputation of the President, his party, and the opposition block. President Peña Nieto is being heavily scrutinized by the local and international press for his shady personal finances and a nonchalant response to the social unrest. President Peña Nieto spent the first two years of his administration on an international public relations campaign to improve the image of Mexico and prime the country for foreign investment. The campaign initially worked: from 2012 to 2014, Mexico was regarded as one of the more stable Latin American markets. This image has been tarnished over the last two months and the currency depreciation is showing the waning international confidence on the Mexican economy. Gangs and violence, for example, have resurfaced on the media’s radar as well as government corruption and human rights abuses. How can a system that has unraveled to this point grow moderately in 2015? Just last week, the IMF convened in Santiago, Chile, to restate its broad support for Latin American governments. The empathetic statement had an undeniable touch of solidarity. IMF president Christine Lagarde felt the need to reassure Latin American governments that much had been achieved in the post-2008 depression years, but that key challenges and risks lie ahead. This message might be more important for those thinking about investing in Mexico than last month’s IMF report forecasting moderate growth. Daniel Lemaitre is the incoming Pastor Fellow at the Carter Center’s Americas Program. Check out his other writings at Global Risk Insights. A special thanks to Victor Tapia Poma for sharing insights on Mexican party politics. 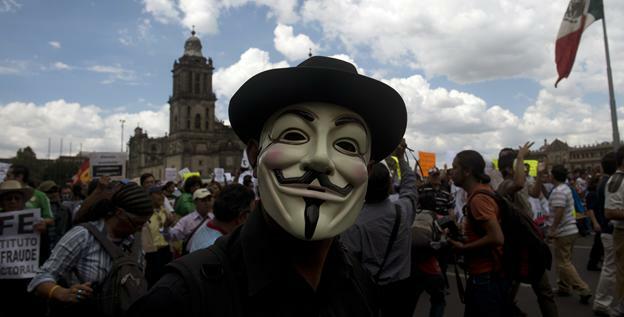 This entry was posted in Mexico + Central America and tagged 2014, 2015, 43, affect, Daniel Lemaitre, Economy, effect, Enrique Peña Nieto, hydrocarbon, iguala, Latin America blog, Mexico, normalista, oil, PAN, PRD, PRI, protest. Bookmark the permalink.